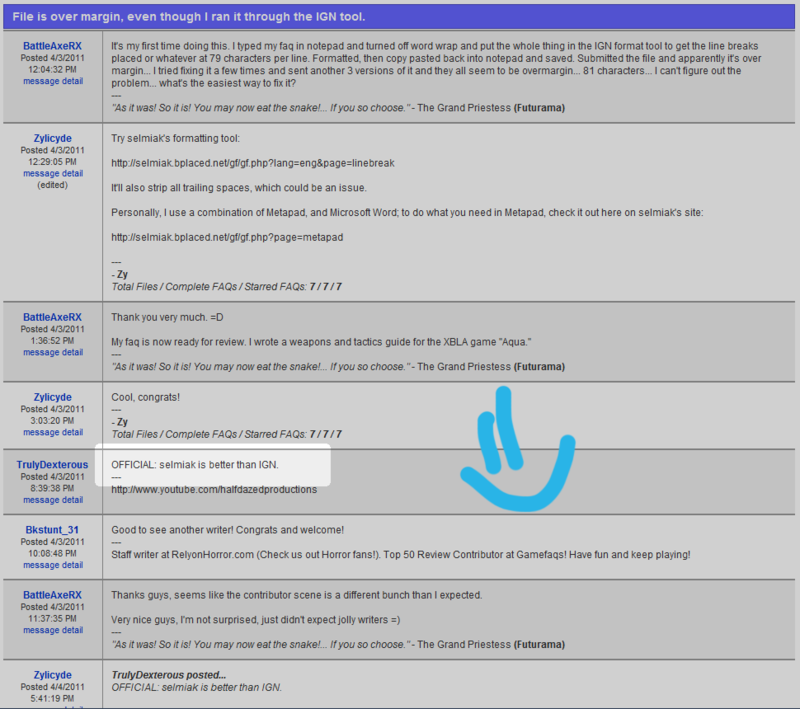 You want to know how to write an FAQ for GameFAQs? Well, with the help of the articles, tools, links and programs featured on this page it will be easy to get your guide published on GameFAQs. After reading all there is on this page you know a lot about writing an FAQ for GameFAQs. If there are still questions after reading all this, ask them in the comments at the end of this page or visit the FAQ Contributors Board and ask there. An Article I wrote to help every FAQer. If your submitted guide was rejected for 'File is over margin' this is just what you need. Just create your tables with enemy values or weapon stats in excel, export it as csv and paste this in here, the formatting tool handles the rest while you can finetune lots of things. Just paste your text in there and let the script handle the linebreaks. Justification, centering, remove trailing spaces on a plain text (.txt) file get easy as never before and there are even more options for formatting available. According to newest surveys this tool, this page and most importantly I am better than IGN. Thanks TD! The biggest part of this Article is written by Zylicyde and explains how to use the non breaking space for FAQs and how to commit word wrap even though the characters are transformed into characters even more special by this and even features a script to make MS Word do this for you. You wrote an FAQ and submitted it. It got rejected. You want the FAQers to review it. Upload it to one of those freehosts linked there so other FAQers can have a look at your FAQ and give you tips on improvement and finally getting it accepted. TextWrangler is made by the same developer as BBEdit is, which is recommended by GameFAQs, but TextWrangler is better. Don't forget you have to enter the .txt file extension on your own when saving your FAQ in TextWrangler. Osrevad's and DomZ Ninja's ASCII-Art collections with lots of great gamelogos and ASCII drawings of different controllers. In case you want to know how to create nice ASCII Art images that you can use on the GameFAQs messageboards you better keep on reading here. Good FAQs on how to create your own ASCII Art and some more FAQs! And in case you want some inspiration for really cool and 1337 ASCII Art please check out ASCII Arena. If you are lazy and want the help of a computerprogram to create your ASCIIArt you eventually might want to check out ASCII Art Studio. I don't like this one much, much better is ASCGen 2. There is even a short but good ASCGen 2 Tutorial available. Ascgen is good for converting images and logos of games to ASCII Art, it looks even better if you go over the result by hand again and use the ASCII Art generator only as a starter! An article about when to use PNG, JPG and GIF and the advantages and disadvantages of every format. Good stuff if you want to map out a game. This expands the GameFAQs article about the formats. Go to your hits page and paste everything you find there in the form found under the link above. Set your options and let the magic happen. Navigate to the Data Page of the game you want to change, click on Data Submission Form at the bottom of the page and choose whatever release is available. It doesn't matter which release you choose, as the text is for every release listed. Now you have to fiddle around with the url in the addressbar of your browser. Here you change the part &release=12345 to &edit=update and press enter. Voila! If the mentioned part is not available in the URL you just append the &edit=update and acknowledge with enter. The ambitiuos goal of this project is to write a complete FAQ for every game ever released for the NES/Famicom. Well, even unreleased, cancelled and only released as prototype games are included and actively written for. The page is maintained by Devin Morgan. You will find a lot of stats, a list of all games still missing a complete FAQ and a link to the current discussion topic on the FCB on the Completion Project Page. Join now! Otherwise it might be too late! The ambitiuos goal of this project is to write a complete FAQ for every game ever released for the Sega Master System. Well, even unreleased, cancelled and only released as prototype games are included and actively written for. The page is coded by me and maintained by Games and me (selmiak)! Lots of interesting stuff can be found there and you can even sign up for the site and use some automated features. The ambitiuos goal of this project is to write a complete FAQ for every game ever released for the Gameboy. This project includes also Gameboy Color games, but no Gameboy Advanced games (...yet). Well, even unreleased, cancelled and only released as prototype games are also included and actively written for. The page is maintained by vinheim and RedIsPoetic! On this page Crazy Reyn collected a lot of interesting threads from the famous FCB. This is history kids. A lot of people don't know a board like this even exist on GameFAQs. This is where the FAQ writers and starting FAQ writers meet. Come on over, and ask your questions. If you don't get help there then you won't get it anywhere else. ...well, at least not here. Remember, there are no stupid questions and we all started where you might be now. Just don't be shy and post on the FCB. Last Update: 22.01.2006 - timski's absolutely outdated, but huge statistics page. Shows the activity of the FAQers in the past. The Picross DS FAQ by DEngel with its 6958 kB is the biggest single file on GameFAQs. 2nd Place - Pokemon Black Version - Pokedex (4957 kB) by ares9090. 3rd Place - Pokemon Black Version 2 - Pokedex (4536 kB) by KeyBlade999. 4th Place - Final Fantasy 12 (PS2) FAQ (4163 kB) by Split Infinity. Scroll down to the Game Genie Codes for Mega Man X2 and Mega Man X3 for the SNES. These are some of the, if not the smallest files contributed to and posted on GameFAQs. Another really small File on GameFAQs. The Currency Reference looks smaller than the Game Genie Codes, but is 1kb. Same goes for this GameGenie Codes. This is even smaller than the MegaMan Code Guides but listed as 1kb on GameFAQs. RARusk, ChaosDemon and PapaGamer are featured, interviewed and stuff. Thanks to CyricZ for finding the article. featuring Absolute Steve, DEngel, CJayC, the history of GameFAQs and some future insights and job opportunities. Thanks to Absolute Steve for finding the article. Absolute Steve takes a deep and long look into the future of guides and FAQs. Also the past and present is elaborated. An interesting read for every FAQer. An Article about the professional Prima guides and the industry dependend on gamepublishers behind it. Thanks to A I e x for finding this. Just look who signed it!